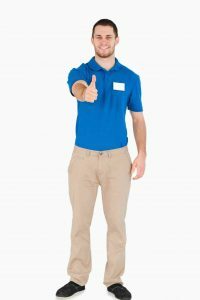 3 Ways to Keep Company Uniforms Clean | Ace Uniform Services, Inc.
How do you keep your employee uniforms clean? Company uniforms are the best way to make your business more professional, make your branding more cohesive, and ensure that all employees are wearing the same exact thing when they’re on the clock. Keeping them clean can be a little tricky, especially in messy food service businesses or auto shops. Here are your three core options for keeping company uniforms clean. Many businesses require their employees to clean their uniforms at home. While this is a great cost-saving measure in the short term, it ends up costing more in the long-term due to laundering practices. Certain garments need the right detergent or a meticulous washing cycle to stay clean. Other clothing will not function properly if it isn’t washed properly, like chemical or fire-resistant clothing. Asking your employees to wash their own uniforms almost always results in fading, lower-quality cleaning, and a mismatched workforce. In-house laundry services can benefit employees since they can go home with a freshly laundered uniform every day if they need to. This option can add up quickly since heavy-duty washing machines and clothes dryers are not cheap. You’ll also need someone to man those machines and take care of keeping the uniforms organized. Additionally, you’ll need to have the space to add a laundry operation to your business, which many places do not have the luxury of. This entry was posted on Friday, March 31st, 2017	at 1:38 pm	. You can follow any responses to this entry through the RSS 2.0	feed. Both comments and pings are currently closed.